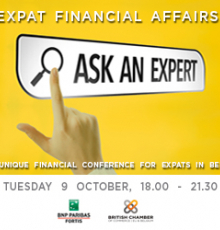 The annual British Chamber Expat Financial Affairs conference offers essential advice in English on managing your finances as an expat in Belgium. Get direct access and learn from our informative presentations on investments, pensions, financing your Belgian residence and becoming a successful entrepreneur, and mingle with fellow expats over food and drinks. The event is set in the heart of Brussels at BNP Paribas Fortis’ beautiful La Chancellerie venue.